Thai cuisine is one of my favourites. In fact, we have a world class Thai restaurant in the city here that we frequent and love - largely because they offer so much choice in vegetarian food. Of course, I do make Thai food at home too, experimenting with various spices and sauces. My favourites are green curry, yellow curry, sticky rice, pad Thai, light summer rolls, dumplings, bananas in coconut cream, and of course the tasteful Thai chili sauce!! This month the Daring Bakers Kitchen set us a lighter challenge than those we have grown accustomed to in the last few months of 2008. It's the ultra light French cookies known as Tuiles!! This month's challenge is brought to us by Karen of Bake My Day and Zorra of 1x umruehren bitte aka Kochtopf. They have chosen Tuiles from The Chocolate Book by Angélique Schmeink and Nougatine and Chocolate Tuiles from Michel Roux. Despite it being an unusually busy time of the year, I really was very excited about this challenge. And was even happier when I saw that a savoury version had been added. I don't have much of a sweet tooth, and so just the thought of a savoury alternative made me happy, more so as I knew that I would not really have the time to hunt for alternative recipes this month. The Savory Tuile recipe provided via DBK is from Thomas Keller The French Laundry Cookbook. In a medium bowl, mix together the flour, sugar and salt. In a separate bowl, whisk the softened butter until it is completely smooth and mayonnaise-like in texture. Using a stiff spatula or spoon, beat the egg whites into the dry ingredients until completely incorporated and smooth. Whisk in the softened butter by thirds, scraping the sides of the bowl as necessary and whisking until the batter is creamy and without any lumps. Transfer the batter to a smaller container, as it will be easier to work with. 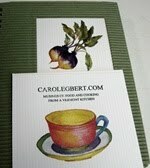 Preheat the oven to 400 degrees F. Make a 4-inch hollow circular stencil. Place Silpat on the counter (it is easier to work on the Silpat before it is put on the sheet pan). Place the stencil in one corner of the sheet and, holding the stencil flat against the Silpat, scoop some of the batter onto the back of an offset spatula and spread it in an even layer over the stencil. Then run the spatula over the entire stencil to remove any excess batter. After baking the first batch of cornets, you will be able to judge the correct thickness. You may need a little more or less batter to adjust the thickness of the cornets. There should not be any holes in the batter. Lift the stencil and repeat the process to make as many rounds as you have molds or to fill the Silpat, leaving about 1 1/2 inches between the cornets. 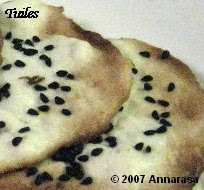 Sprinkle each cornet with a pinch of black sesame seeds. Place the Silpat on a heavy baking sheet and bake for 4 to 6 minutes, or until the batter is set and you see it rippling from the heat. The cornets may have browned in some areas, but they will not be evenly browned at this point. Open the oven door and place the baking sheet on the door. This will help keep the cornets warm as you roll them and prevent them from becoming too stiff to roll. Flip a cornet over on the sheet pan, sesame seed side down and place 4-1/2 inch cornet mold at the bottom of the round. If you are right-handed, you will want the pointed end on your left and the open end on your right. The tip of the mold should touch the lower left edge (at about 7 o'clock on a clock face) of the cornet. When all the cornets are rolled, return them to the oven shelf, close the door, and bake for an additional 3 to 4 minutes to set the seams and color the cornets a golden brown. If the color is uneven, stand the cornets on end for a minute or so more, until the color is even. Remove the cornets from the oven and allow to cool just slightly, 30 seconds or so. Gently remove the cornets from the molds and cool for several minutes on paper towels. Remove the Silpat from the baking sheet, wipe the excess butter from it, and allow it to cool down before spreading the next batch. Store the cornets for up to 2 days (for maximum flavor) in an airtight container. I followed this recipe but I have to say that it did not work too well for me. For one, the batter consistency was not as I would expect to make Tuiles! Secondly, the oven baked Tuiles did not take a shape very well. They are more on the crisp side and broke rather readily. I tried several batches. Above are the ones I managed to save!! And finally, the taste just did not sit well on our palette :( Maybe I'll try the sweet cookie next time. Hoping for better luck then!! Last weekend I visited a cheese shop in our parts and was delighted to see some lovely artisan cheeses on the shelves. The one that caught my eye was none other than a - hold your breath - three alarm cheese. With a name like that I just had to pick it up. A spicy mix of three different chilies lends its name to this cheese. And no more than the tiniest bite assures you that this cheese was made to live up to its name. Now, as almost everyone would agree, there is nothing quite like hot toast with tea on a freezing winter afternoon!! The only thing that can make it better is some spicy melted cheese on the top - Yum! 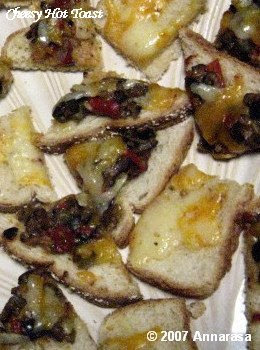 And if you want something superlative, stick some tapenade on the toast just under the cheese. Pre heat the oven to 350F. Place the bread on the wire rack and toast until crisp and golden. Remove from the oven and butter each slice. Now thickly spread the tapenade on two of the slices. Mix the two cheeses, and spread equally on the 4 slices. Return to the oven and grill until the cheese melts completely. Carefully remove the toasts from the oven. Cut into squares or triangles. Serve immediately. These mini-toasts are superb with a cup of tea or coffee. They are also great when served with wine. 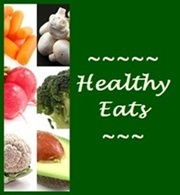 These spicy snacks are making their way to Pallavi @ All Things Yummy. 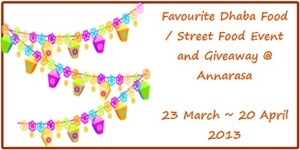 Don't forget to visit Sunday Snacks this month, where you will find all things Hot n Spicy!! Welcome back to a second helping of Festive Breads via Bread Baking Day #15. 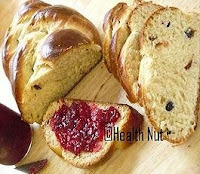 You will find the first part of this roundup at A Roundup of Festive Breads: BBD #15. Live :: Love :: Laugh :: Eat! is the delightful name of Kim's blog. Kim's resolution for the new year is to try new things and baking bread is one of them! 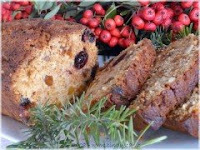 She has made a truly spectacular start with the Ginger-Orange Quick Bread that she baked for her co-workers for Christmas. 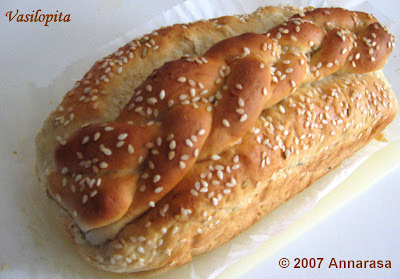 Here's to experimenting with more bread recipes in 2009. 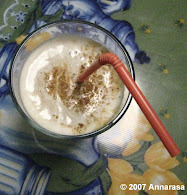 For a great tip on where to find candied ginger and a whiff of the warm aroma of ginger-orange, drop by at Kim's blog. Emma of Gustoto baked a traditional camp fire bread from Australia for BBD #15. She says that when this bread is seasoned with chives, basil, and semi-dried tomatoes, the Damper turns into a truly festive treat!! 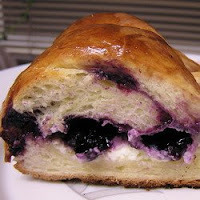 Toby from Foolish Poolish Bakes has a treat for us all - a gorgeous Panotenne. Read the story of an adventure spanning no less than four months to achieve this result. Just a quick peek at the bread - its colour, texture, and taste all make the effort worthwhile. Hats off to Toby for his dedication and persistence. 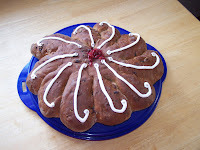 Bejgli is a traditional Hungarian Christmas Bread and Dulmina from Dulmina tündérkonyhája or 'Dulmina's Fairy Kitchen' has baked a more vegan-friendly version of this bread. She has used whole wheat for the bread which she filled with walnuts and poppy seeds. 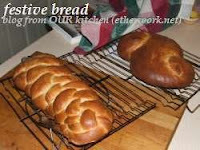 This bread is not only beautiful but easy to create too!! How does Hot Cross Buns with cocoa sound to you on a chilly winter morning? Natashya chose these traditional buns from Nick Malgieri A Baker's Tour as her contribution to BBD #15. Visit her blog Living in the Kitchen with Puppies for a look at this fragrant spicy bread with the surprise ingredient of chopped dried apricot!! 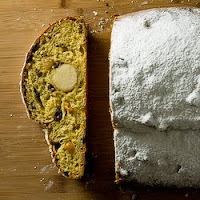 Gine from i dolci fanno felici baked an exquisite Austrian Nut Bread for the holidays. Eaten in Austria and German homes around Christmas is easy to put together, full of flavour, and a real delight to serve - just look at all those lovely almonds!! Teresa of Discovering Sourdough chose her famous Festive Hawaiian Rolls to serve with coffee on Christmas morning. Beautiful sourdough is filled with a coconut, nut, and cinnamon paste, slashed, and then baked to perfection. Can you just imagine the aroma wafting through her kitchen? 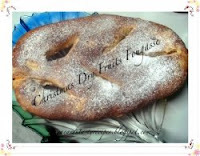 Panfrutto is a popular fruit flavoured bread baked around Christmas in Italy. It is a favourite of Cinzia of Cindystar who says that this is a very easy recipe to create, stays well, and can be pulled out of the pantry in a snap should you find unexpected guests knocking at your door!! 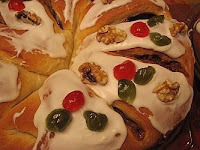 Glenda of Domesticated Engineer has sent in her own special recipe of Glenda's Christmas Bread. 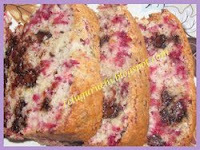 A wonderful recipe for a home made bread, it uses whole spelt flour, shredded zucchini, pomegranate juice, and walnuts! Glenda shaped this versatile dough into a tree and a wreath. 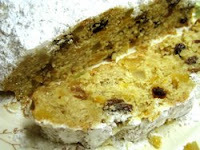 The famous German Dresdner Stollen was Preeti's choice of bread for BBD #15. 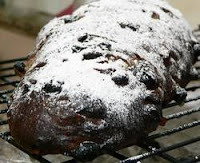 Though Stollen is a staple in German supermarkets at this time of the year and Preeti purchases one every year, this year she decided to bake one herself. 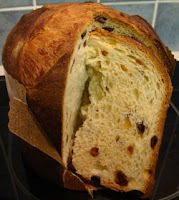 Follow Preeti's very first attempt to making a delicious loaf of Stollen at My Kitchen Stories. Judy from Judy's Gross Eats took the All Purpose Holiday Bread recipe from Peter Reinhart's Crust & Crumb, and fashioned it into a lovely Christmas Bread! She says she loaded the dough with sliced almonds and finely chopped dark chocolate and made Boules!! Simply beautiful. Thanks Judy for finding the time in your busy schedule to join it the festivities. Find her recipe at All Purpose Holiday bread. 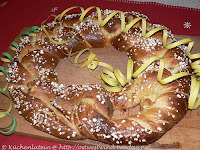 Ulrike of Küchenlatein shared her recipe for a celebratory New Year's Pretzel. Ulrike notes that a pretzel is the symbol for infinity and is also considered to be a a good luck charm or blessing. In parts of Germany, the sharing a New Year Pretzel with friends and family is said to bring good luck and well-being!! Sarah from What Smells So Good? baked a fragrant Vanilla-Apple Honey Challah on the first night of Chanukah!! Sarah says the holidays are filled with her baking all kinds of goodies and even though she thought she was done for this year, she chanced upon a recipe she had saved some time back!! 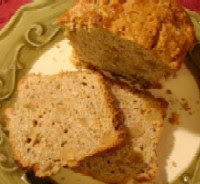 Encouraged by her Mom, she tweaked the recipe to add Kamut flour, applesauce and vanilla to create a beautiful and golden loaf. Keep reading for the final part of this Roundup!! In Greece New Year's Day is also known as St. Basil's Day. St. 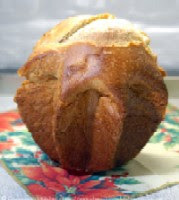 Basil was the father of the early church and it is in his honour that Vasilopita is shared amongst family and friends at the stroke of midnight in many Greek homes! The tradition of cutting the Vasilopita on the first of January is said to bless the house and bring good luck for the new year. Traditionally the first piece is offered to the saint himself, the second piece distributed amongst the poor, and the third piece goes to the senior most member of the family. Typically the the baker hides a coin in the Vasilopita, and the person who gets it is deemed blessed for the year. Of course in the old days there was a reason why the coin was hidden in this festive bread and why indeed this bread is baked!! 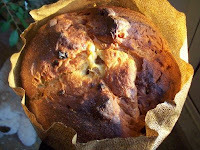 Vasilopita is made in honor of a wonderful act of charity by St. Basil to the poor of his flock. St. Basil wanted to ensure that the needy would have enough money for necessities. But he was also aware that they were proud people and would not accept money. St. Basil asked his church members prepare some sweet bread with coins baked into them. In this way he was able to give them money without demeaning them. 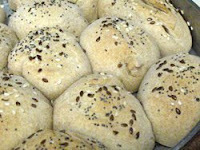 Despite its distinctive simplicity, this bread is very rich. But it is also beautifully fragrant and tasty. As I searched for recipes for BBD #15, an event started by Zorra , which I myself am hosting this month and for my very first entry for YeastSpotting hosted by Susan, I kept finding recipes that asked for anything from 6-12 eggs and a kilo of all-purpose flour!! I could not even begin to tackle reducing these quantities but I did want to bake this bread - simply because it was not too sweet and because I adore anise!! So after much searching I came about a recipe that I felt could be tweaked to our requirements here while keeping with the original taste and texture of the bread. The original recipe is at the bottom of this post. What follows here is my version of this traditional New Year's Bread!! Sift together 1 cup of the flour, yeast, lemon peel, and anise seeds. In a separate saucepan, heat the milk, butter, sugar, and salt until all the butter is melted. Add the heated milk mixture to dry ingredients, and the add egg whites to this mix. Blend well. Stir in the remaining flour to form a soft dough. Knead this dough on a lightly floured surface for around 7 minutes. Place the dough in a greased bowl. Coat the top of the dough with some butter. Cover the bowl and let it rise in warm place until it has doubled. This may take a couple of hours. When it is risen, punch it down. Divide it into half. Flatten one half of the dough in greased loaf pan. Shape other half into 3 ropes. Braid them. Seal the ends and then place on top of the dough in the pan. Glaze the top of the loaf with the orange juice. Sprinkle generously with sesame seeds. Let the loaf rise in warm place until double, around 45 minutes. Bake in a preheated oven at 375 degree oven for 25-30 minutes or until the top is golden brown. Remove the loaf, cool in the pan for 10 minutes, then turn out onto a wire rack to cool thoroughly. This bread tastes delicious on its own, and even better when it is toasted. Serve with a a pat of butter and a dollop of your favourite jam or conserve!! Here's to a Happy New Year and blessing to one and all. Recipe Source: Festive Bread Book, The by Kathy Cutler, Barron's Educational Series, Inc., 1982.